Fig. 43. Soporific poppy (left - fruit-capsule). 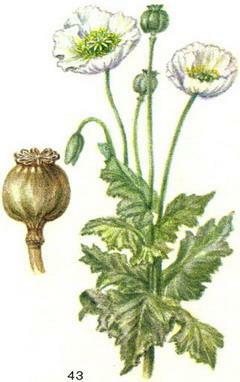 Soporific poppy, opium (Papaver somniferum L.) - cultivated plant. The Poppy Family - Papaveraceae Juss. Well-known medicinal plant height of 50-70 see Stems poppy glaucous, glabrous, slightly branched above. Leaves amplexicaul, bottom, to the base narrowed, in the form of an oblong obovate, dentate along the edge. The flowers sit on the peduncle, quite large, sometimes in a Bud droop. Petals are white or colored in pink, purple, available. On the blooming ends formed many-seeded Boll. Small seeds her painted white. Culture originated in prehistoric times, perhaps in the Western Mediterranean. Came into East and South Asia in the VII-X centuries. Central Asia, North-Western China - the second ancient center of culture and the center of the origin of opium forms. The basic areas of cultivation of poppy sleeping-pills - Asia Minor, Iran, India. The main alkaloids are morphine, codeine, papaverine and others, in Addition, found gum, caucasophobia and fat-like substances. Source of opium (see) Opium drugs are used as an analgesic and sedative in cough, diseases of the gastrointestinal tract.